We often travel north on US 395 by truck and vintage trailer; because it is so historical, beautiful and captures our imaginations. This past summer, we were camped with our 1950 Westcraft vintage trailer at Lee Vining with our friends in their large motorhomes (usually there are a couple more vintage trailer folks camped there, also, that we have never met because Mono Vista Resort welcomes our little vintage trailers). Additionally the small federal, state and county campgrounds in the surrounding area accommodate vintage trailers, too. Chuck loves to fish for trout in his kayak. I can’t even get one bite on my line while kayaking; I just enjoy the kayaking experience and the scenery. Chuck goes fishing in his kayak . 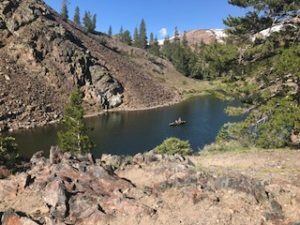 . .
One morning I decided to stay on shore by myself atop a small knoll where I could just relax and enjoy the serenity of the lake and its surroundings at my own pace. A couple days before, a friend shared a book he had just purchased entitled, Tales Along EL CAMINO SIERRA. We searched the small town of Lee Vining which is near the entrance to Yosemite National Park and finally found another copy for ourselves at the Old Schoolhouse Museum and Upside-Down House. I decided this was the perfect moment to peruse the book. Once I began, I could not close this book. It so captured my attention and interest. First of all, the large print made it easy to read with my aging eyes. 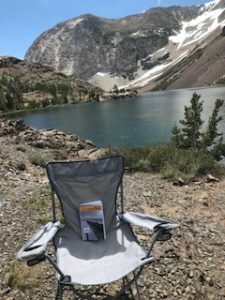 The stories and anecdotes tugged at my heartstrings bringing back nostalgic memories from trips-past spending time camping and fishing at Tuolumne Meadows and other Eastern Sierra landscapes. The details were vivid and brought back earlier times. A gentle breeze kept my body cool as the sun shone down from above. That morning was our last day in the area before journeying home the next morning. What a perfect way to bring all of the local natures’s sights, sounds and scents together in one place which we experience on this annual trip. I have to share that I cried and laughed as some of the tales and events unfolded. I finished the reading, closed the book and our group came ashore within moments. I truly valued reading this paperback book in the hilltop, lake-view setting. The history along 395 is more entrenched and meaningful to me now as we continue to revisit some of the sites along the way on future roadtrips. In 2014, we traveled US 395 from its beginning in Washington state south to Victorville, Califonia, where we departed the road. I learned something new on almost every page about the wonderful highway. Contemplating details in these unique stories often brought moisture to my eyes. The few places I have not visited are now more clearly defined and motivate me to want to visit these sites such as the *alleged “short hike to the Tuttle Creek Ashram”. I am more familiar now in learning how many of the locations got their names. About a month ago, we traveled on 395 toward Minden, Nevada. We left the highway to visit Onion Valley from the town of Independence. To find out why we decided to take this road, you will have to get the book to find out why this little side trip is worth the drive. 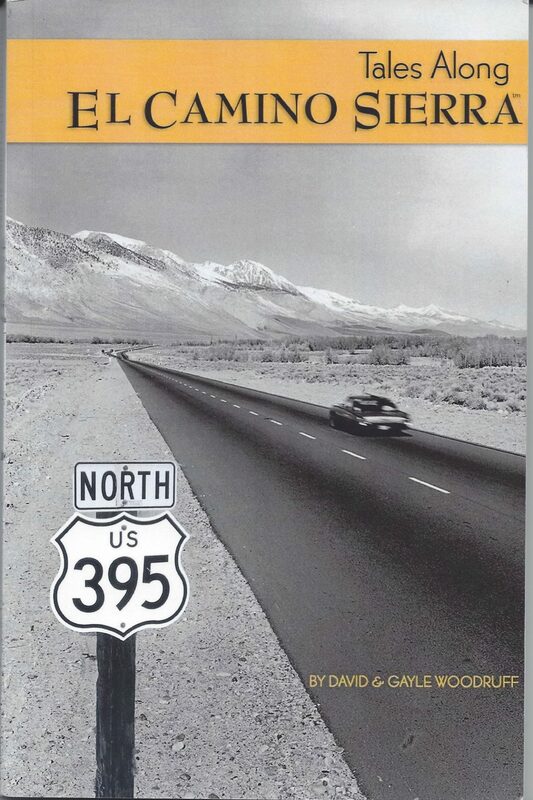 If you have never driven 395, read this narrative book and take it along for some in-depth insight. Part of the reason I enjoyed this book so much is that I am familiar with so many of the sites storied. It is well written and many photos are included. I hope David and Gayle Woodruff follow up with more historical stories they researched and didn’t have the opportunity to include in this book. I know I’d purchase one. 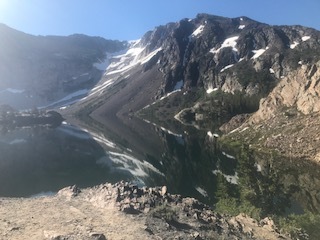 *The term alleged is used because our small group of 5 adults, two dogs and only one small bottle of water (thanks to a smart friend who always has a bottle of water in her hands) decided to take a “short hike” which we thought would be about a mile and a half (3 miles roundtrip). We did not reach our destination but hiked over 6 miles up and down hills in warm weather. We did sip a little water from a small stream once. Folks, always take water with you when hiking; of course you already know that. I hardly ever take water with me. To quote Forrest Gump,”Stupid is as stupid does.” Accordingly, we will take water with us if and when we finally hike to the ashram. Overview of Lake Ellery as I sat reading this book . . .